"Quite honestly, if Iron Speed Designer was not an option, this project probably would not have even started because the time frame to finish it was too tight..."
The Bus Stop Portal application was built for the Logan Bus Company of New York City. Its primary purpose is to provide a Web site where parents can find the pick-up and drop-off times for their children's school buses. Additionally, the application tracks all relevant information about schools, buses, drivers and students in one centralized database. In order to provide better service to the community, the New York City Department of Education wanted parents to know the estimated pick-up and drop-off times for their children and mandated that school bus companies in New York City maintain a Web portal with this information. If the buses are late for some reason, the Web site must reflect that delay. To further complicate matters, the Department of Education makes changes to routes and student stops on a daily basis. For security reasons, downloading the raw data was not an option. The only available option was to build a secure Web portal where parents could log in and view the bus routes, stops and student information. The Logan Bus Company investigated alternatives, but because of the specialized nature, there were no off-the-shelf packages available. The application is comprised of one Microsoft SQL Server database with 15 tables, four views, and 80 Web pages. With the number of routes exceeding 1,000 and the average number of stops per route exceeding 25, we needed to design the database so it could be easily expanded	to cover many bus companies. The final database handles nine different bus companies with their individual routes and student stops. 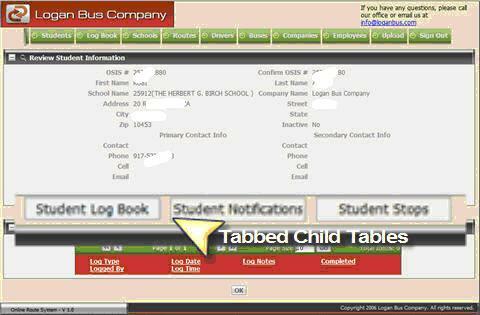 At present, the "stops" table has over 50,000 stops for all students, routes and bus companies. The application is designed so that all nine bus companies use one database and one application. A lot of information is generated in real time using the URL information of the page requested. In addition, the images are updated dynamically to reflect the unique design theme of each different bus company. Because the application developer was using Iron Speed Designer, the basic page layouts were completed in the first week even though there were many requirements changes during that time. We spent the second week adding custom code to automate the process of showing dynamic information. We also programmed some back-end processing, including e-mail confirmations and resorting the routes after receiving daily changes from the Department of Education. After the second week, the application was more than 90% complete and the Logan Bus Company was quite happy with the progress. 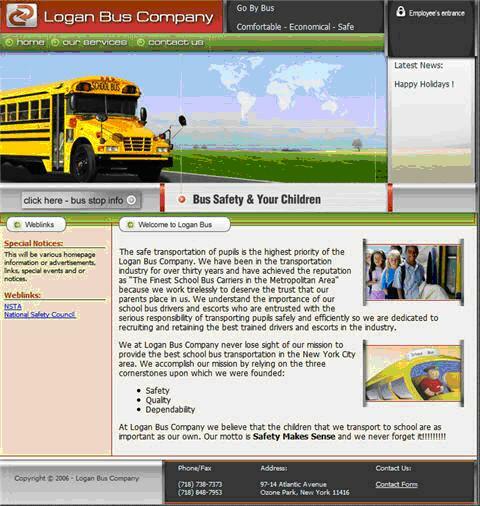 Since the application keeps track of all company communications with parents, students and drivers, Logan Bus Company sends confirming e-mails to the appropriate parties. As the data changes every day, the routes need to be updated in real time. For example, if the student from Stop #2 is not going to be picked up after next week, the route and data must be changed to reflect the updated times for all the stops after Stop #2. For the most part, Iron Speed Designer had examples of code customizations that we could use to finish this project. No third-party control was used in this application. We designed an application-specific theme to match Logan Bus Company's Web site. The parent-child page layout produced long Web pages because of the access to route information, log information, event information, and contact information. To make the pages shorter we integrated a tabbed page concept. This resulted in a web application which looks very much like a Microsoft Windows application with tabbed sections for all details. It was a tremendous help that Iron Speed Designer took care of most of the repetitive tasks. Except the daily upload process, this application does not have a lot of transactions during the day. The final production solution resides at a GoDaddy.com-hosted website. The response time has been very well accepted. Quite honestly, if Iron Speed Designer were not an option, this project probably would not have even started because the time frame to finish it was too tight. Iron Speed Designer's best feature was its awareness of database changes, which allowed the changes to be incorporated into the application in a matter of minutes. This allowed us to chase the "moving target" as the Department of Education kept changing its requirements kept changing their business process and requirements. The next phase of this project is to integrate with some mapping services, like MapPoint, to automatically update the pick-up and drop-off times in near real-time. A GPS device may be integrated to update the database every time the bus "STOP" sign is opened by the driver to pick up or drop off children. Akesh Gupta is co-founder of ExecuTrain of Long Island and Light Speed Solutions. He is passionate about technology and loves sharing his knowledge with others. ExecuTrain of Long Island is a corporate training company specializing in bringing real world knowledge to the training room. Light Speed Solutions is a professional consulting and software development company that focuses on turning business vision into reality. Akesh Gupta has more than 14 years' experience in designing and developing successful applications. Light Speed Solutions has become a one-stop solutions center offering advanced, diversified expertise in all facets of development, with complementary expertise in systems, reporting and accounting.